We are super excited to bring you this very special lineup celebrating some of the Bay Area’s most dedicated and talented Junglists. The party is free before 10:30, and there are 2 for 1 drinks until 11pm!!! SHADOW SPIRIT will be getting the vibe alive, and the bodies moving during the first hour. Expect him to serve it all up, from A to Z, back and beyond inside the dancehall! One of the newest and perhaps, best, tag team duo’s in the history of the Bay Area, SENATOR & DJM, are both ready and set to rock it from 11-1. Always innovate, and ever so clever, these two have combined a couple of of the most lucrative music collections on the west coast, and know exactly how to use them! Rolling it out for the final hour, THE DOCTOR will keep the dancefloor sweaty, and the presha heavy, showing us why he is one of the the most well respected selectas is the Northern California electronic music community. Just when you thought you were safe, MC DUH will be providing the lyrical control, while mastering the ceremony and making sure you understand what is going on. 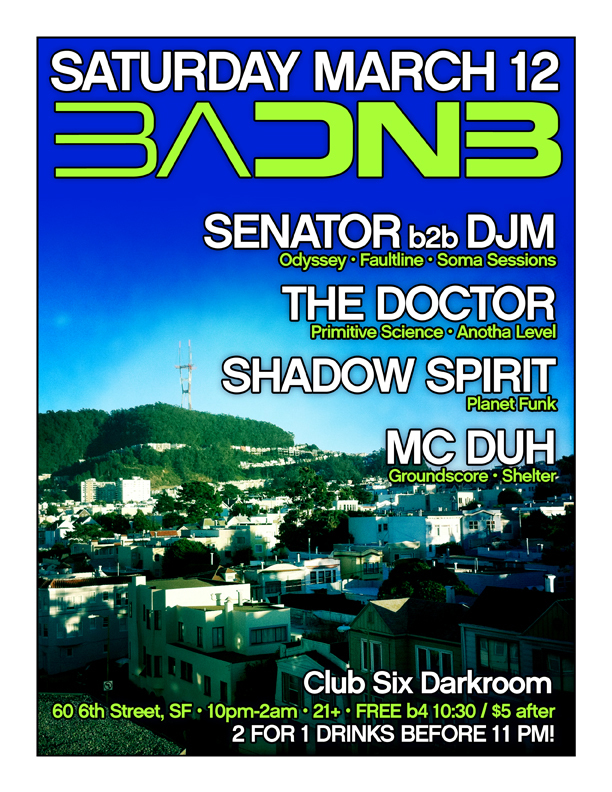 This entry was posted in Events and tagged badnb, drum & bass, mc duh, senator by DJM. Bookmark the permalink.